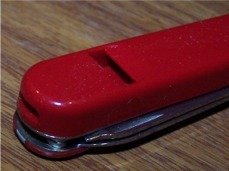 The whistle is a scale tool found only on the 58mm Whistle knife. The special scale is about twice the thickness of the regular scale with a hole at one end where one blows, and an opening on top part way down for the air to escape and produce the whistle sound. Created by RedRamage. Last Modification: Sunday 11 of September, 2011 23:09:26 CEST by ICanFixThat.